Much has been written in the last 18 days and specifically in the last 36 hours about the kidnapping and murder of our precious boys. Scholars, writers and Torah giants have written about this and my pain is echoed in their words. Today, I have something different to say. Today, I’d like to say thank you. For those who have read previous posts of mine you may know that I am mother to a child with special needs. He is 9 ½. We have two more wonderful children, a son who is 8 and a daughter who is 4. I feel privileged to be raising them in our homeland together with our brothers and sisters of Am Yisrael. Recently I have been thinking about how parents successfully foster independence in their children. I came up with trust and faith. When parents show trust and faith in their children and their abilities it gives them the confidence to do things on their own. Parents know their children best. Having trust and faith in your child does not mean sending him or her blindly out into the world at whatever age you feel like, but rather knowing what your child is capable of and believing in him or her enough to know that when you are not around they will be able to function in that capability independently. And that is where my gratitude to you, my brothers and sisters comes in. Any rational person understands that there are dangers in the world that are out of his control. But it’s because of you, my dear nation, neighbors and friends, that my 8 year old and his friends walk home from school. And it is because of you that my 9 ½ year old gets off the (school) bus and comes upstairs by himself. It’s because of you that he waves goodbye as he walks out the door in the morning and heads to the bus, again by himself. It’s because of you that my daughter walks out of our apartment by herself—well, that’s not okay, but it’s only because of you that she thinks it is. You see, you went and fed the soldiers that were searching for our boys. You prayed for our boys at every turn. Thoughts of them dominated your life for more than two weeks. You mentioned them in between songs on the radio and began with them at every newscast. You came together to sing and pray for them. You reached out to people who were different than you, but who at their core are your family. When my son and his friends ask you for help crossing the street you stop and help them. When they need a phone to call home, you let them borrow yours. When my son gets off his bus and you are passing by you watch until he gets into the building. I know because I’ve seen you do it. I know because I do it for your kids. It’s because of you that I can still tell my children that most people are good and that they can ask for help if they need it. With this independence that they relish, that they have with your help, I see my children flourishing. I see their confidence in themselves. I see my 9 year old exceeding everyone’s expectations as he learns to do more and more by himself. When my children grow up to be the strong, intelligent individuals I see them blossoming into, I’ll know who to thank. They say it takes a village to raise a child. In our case, it takes a whole country. 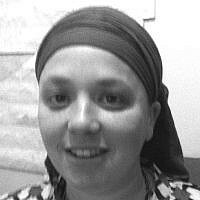 Ita is an English teacher from New York, living the life with her family in Jerusalem.